Daily coverage of the United Astrology Conference (UAC) in Denver is in Eric's blog. Audio coverage begins this weekend. WE ALL KNOW how weird Mercury retrograde can be. On a mundane level, it's usually simpler than the psychological level; i.e., it's easy enough to back up your disk drives early and often. It's also wise to avoid doing anything of the kind during the few days close to the stations, and all it takes is a little planning. 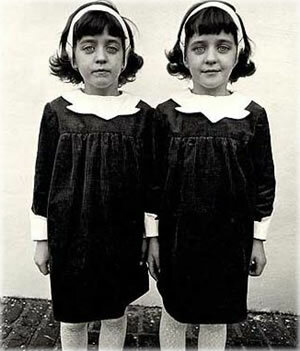 Identical Twins: Roselle, N.J. 1967. By Diane Arbus. With some negotiation, you can avoid signing contracts or making major commitments during the retrograde phase or during those days when Mercury's direction is changing. Conserve your cash and you'll be ready if something goes amiss. All of this becomes common sense after a while, though it's worth repeating. Mercury is retrograde for three weeks about three times a year, and we're about to experience one between May 25 and June 19. There is a phase of about three weeks on either side of the actual retrograde wherein the effect is noticeable; this is called the echo or shadow phase. During this phase, Mercury is moving through the degrees where it's about to be retrograde, or was just retrograde. When the echo phase ends, Mercury takes new territory and continues to do so for about nine weeks before entering a new echo phase. The rhythm of this dance is meaningful to follow and you can learn a lot about astrology and life if you do so. The retrogrades make interesting patterns; for example, focusing on one particular element each year. We are currently in a year of Mercury retrogrades in the air signs. Over the winter, Mercury was retrograde in Aquarius. It will soon be retrograde in Gemini, and later in the year, in Libra. The pattern is not evenly distributed through the signs. For example, Mercury is retrograde least of all in the water signs Cancer, Scorpio and Pisces. I've noticed that, for most people, these are the most emotionally challenging retrogrades. Note that all planets (except the Sun and Moon, which are not actually planets) spend part of their orbit retrograde. The patterns are different between the inner planets (Mercury, Venus and Mars) and the outer planets (Jupiter, Saturn and anything beyond). The outer planets are retrograde part of every year, usually for about four to five months. Venus is retrograde every 18 months and spends the least time retrograde of all the planets. Mars is retrograde every two years. Mercury, which moves quickly, is retrograde three times a year. They all have one thing in common -- when a planet is retrograde, the Earth is closer to that planet. While the issues with communication devices, mechanical objects and agreements are what make Mercury retrograde famous, what makes each retrograde unique and interesting is the psychological and emotional material that surrounds the process. Many have noticed that retrogrades can be creatively potent, deeply introspective and reveal a lot about who we are -- to ourselves, and at times to others. Conspiracies can come unmasked. Gossip can be revealed. 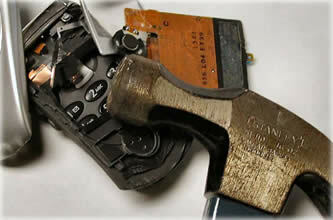 Mercury retrograde may make you want to do this to your cell phone. Image, courtesy of Ian Saxon. We can notice things we would have missed otherwise; odd or long-concealed facts have a way of bubbling to the surface. When this happens, Mercury works a little like Chiron, revealing the weaknesses in a system in a way that helps us fix them. Mercury retrograde is particularly hazardous to those who deceive or make a habit of deceiving themselves: it is a great time for gossip to backfire. All these changes can put stress on relationships, and when you add to that the undeniable factor of miscommunication, things can get hairy. If there is still anybody out there who judges a person's character based on one unreturned email, or even two, I suggest you reconsider your policy. If you send an important email during this phase, perhaps make a phone call to say you did so. People who like Mercury retrograde tend to be the ones who enjoy having their ideas about themselves shaken up, and welcome the experience of new ideas being shaken loose from their minds. They tend to be artists, writers and system-busters of various stripes. In addition to being associated with money and communication devices, Mercury is about the living spirit of our minds, the spark of consciousness that represents self-awareness and conscious intelligence. It is an androgynous god, and appears in many cultures as the archetype of the trickster. The trickster effect is particularly potent during retrogrades, and as annoying as it can be, you can also have a lot of fun playing with ideas, investigating yourself and surfing the threads of synchronicity. In traditional astrology, Mercury rules two signs -- Gemini and Virgo. Both of these signs are mentally oriented, dualistic, and associated with language and intelligence. Of the two, Gemini is more associated with quick wits, skill with language, talent for commerce and multitasking. Virgo is associated with analysis, systematic thinking and service. It is the most self-critical sign, often taking this to excess. In Alice Bailey's system described in the book Esoteric Astrology, Mercury is the ruler of Aries, which if you think about it makes sense. Mercury is a planet associated with ideas, and ideas represent an initiation. Since this retrograde is in Gemini, let's briefly review that sign. Gemini is part of the mutable cross. Mutable means changeable, and what it changes between are cardinal (initiative or impulsiveness: to wit, Aries) and fixed (steady or hunkered down: to wit, Taurus). Bailey associates the mutable cross (Gemini, Virgo, Sagittarius and Pisces) specifically with the awakening of the Christ mind, which I will translate as a unifying spiritual principle. Even if you look at ordinary interpretations of the signs out of Dell Horoscope, you might get this idea. The Inner Twin. Catalina from the Book of Blue. Many of the zodiac signs infer a reference to dualism. For example, Aries and Taurus are both represented by animals with two horns. Gemini is the first sign to depict a human being, a distinction reserved exclusively for the air signs and for Virgo. The other eight signs depict animals. In the first sign depicting humanity, we have two people shown -- and they are twins! I appreciate this bit of cosmic wit, Gemini styled. Yes, people tend to arrive in pairs (but they do a lot of triangulating). The twin metaphor suggests that within every individual is a kind of inner double with whom we are in a relationship, be it conscious or not. Think of this any way you like -- the dark and light sides of our nature; male and female (Mercury is androgynous); the physical versus the psychic nature; or the dual sense of mortality (ego) and immortality (soul) that follows from the myth of Castor and Pollux. Another Gemini theme reminds us that it's impossible to name anything without also implying its opposite; any concept, like "me," also implicitly contains the concept that everything else is not that (everything else is "not me"). This is the original "fall" or separation; dividing the One into manageable little chunks and slices using mental concepts and taking these to be real, when they are all only ever ideas, imaginary dividing lines between me, you, the tree and the dog. This is perhaps the oldest reason why Mercury rules Gemini: because the mind (initially ruled by Gemini) was traditionally said to divide everything into opposites, and be the cause of separation. The first separation always being into "me" and "everything else," which instantly causes insecurity and fear that was not present before that concept. You can always see when babies develop their self-concept because they immediately become insecure and clingy. The twins of Gemini also suggest that many human relationships are typically played out on the level of siblings: not particularly mature, operating by their own rules and -- most significantly -- subject to parental authority (which begins to take hold in the next sign, Cancer: the sign of the mother). Note the paradox: the kids come in the third sign, mom comes in the fourth. Alice Bailey suggests we run the zodiac wheel in reverse and see how well it works (it works pretty good). One of my favorite facts about twins is that they sometimes develop a secret language, called an ideoglossia. Here is an interesting case study. This can be an elaborate, complex language understood only by two individuals. (If there is a linguist in the house who has studied this phenomenon, I would love to hear from you.) People who speak to one another in jargon or coded words are invoking one of the infrequently acknowledged powers of Gemini, which is to exclude others from the private partnerships that are so often formed in the world. Jargon frequently appears among people who buy and sell things with one another, and commerce is a distinct quality of Gemini. Considering all of this, Mercury retrograde in Gemini promises to be pretty interesting. Retrogrades turn inward and they allow us to reflect on the past. I think this will be an exciting phase for people who are introspective, reflective and who value their relationship to themselves on a conscious level. For others, it may feel like being led through a confusing maze. thing to do. Photo by Eric Francis. Looking at the charts, two themes come to mind: mixed signals and brilliant ideas. Humans are famous for their mixed signals. How often do we say one thing and mean another, fully aware of what we're doing (or not)? One might dress a certain way, which seems to be a message to the world, then not appreciate what people think you're expressing. You might play a game of approach-avoid, which sends one of the most mixed signals of all. Hypocrisy is a mixed signal, where people say one thing and do another thing, or hold the world to one set of rules and themselves to another. Mercury retrograde in Gemini can help us see these patterns for what they are, learn from them and, then if necessary, help us rectify them. They are confusing to ourselves and others, and they waste a lot of time. Second: brilliant ideas. The retrograde takes place square Uranus in Pisces. It's dancing around in opposition to the Great Attractor; it makes repeated aspects to Chiron, Nessus and is loosely trine Neptune. This is a lot of flow. The beginning of the retrograde phase teases a perfect square to Uranus; at the very end, the square resolves and, after a long and complex inner journey with many little, big and bigger discoveries along the way, something shifts. I thought I would put a microscope to this unusual transit and see what we discover, looking at Mercury's aspects to the more than 100 minor planets we track, as well as other interesting events that occur during the retrograde. For example, on the day that Mercury stations retrograde, Neptune also stations retrograde, with Chiron close by. So there is a triple station retrograde within about 24 hours, and all three planets are in the air signs. If you are one of those people who is looking for ways to shift your thinking, or searching for new experiences of inspiration, this is a rich moment. We don't have delineations of all the minor planets that are referenced in the sequence of aspects below, but the ones we do have are linked each time. We are planning 16 more delineations for the next annual edition. Aspects listed below that are marked "near miss" are not the closest pass ever of the aspect, but are the closest pass occurring during this time frame. They are usually exact to one degree. This sequence covers from the beginning of the first echo phase through the end of the second one; from May 11 through Saturday, July 5. I won't interpret every aspect, though I'll leave them all in for the sake of the akashic record. It will be interesting to go through the process and take notes on events or thoughts of each day and see how they align with the aspects or not. Note that most (not all) of the aspects repeat a total of three times on this list. This happens each time Mercury is retrograde, because it covers the same 11 or so degrees of the zodiac three times, repeating its aspects to the slow-movers. The aspects below were calculated by Serennu. Mercury (13+ Gemini) sextile Elatus (13+ Leo). Elatus is a centaur planet that I associate with leading people on in situations that they don't understand; or don’t understand the potential outcome of. It has a touch of Pholus, "small cause, big effect" (which you could easily enough apply to all of astrology). Mercury (14+ Gemini) opposite Ixion (14+ Sagittarius Rx). Ixion is a study in amorality. I attribute the key phrase, "anyone is capable of anything," in the best and worst expressions of that potential. In the postmodern era, we know the difference between right and wrong quite well. But we tend to concern ourselves with petty matters and skip over the big ones. It is easier that way. Mercury (14+ Gemini) opposite Great Attractor (14+ Sagittarius). This is an aspect with a polarizing effect on the mind. Things that are not a big deal can become a very big deal, in one's own mind, but there seems to be a faux quality to the controversy. The Great Attractor is a curiously Sagittarian point, vaster than anything known, bigger than millions of galaxies, and which nobody really understands. Therefore, it can represent our relationship to, and how we relate to, who and what we don't understand -- typically, we make up stories. If you make up stories, take them apart and see what they mean before somebody else does it to you. Mercury (14+ Gemini) trine Atlantis (14+ Libra Rx). Atlantis is an asteroid about the use and abuse of technological power, and how we handle that quality. It is also associated with doomsday-type thinking, such as the notion that the end is near. Remember, on the collective level, this is an idea. But we might want to ponder our use of technology as individuals and as a society. Forget right and wrong; do we do anything productive, really? Do we make beauty, or do we mostly chatter? Mercury (14+ Gemini) trine Nessus (14+ Aquarius). Nessus takes the abuse of power on an exceedingly personal level. Nessus can point to the causes and the effects of karma. A trine opens up a mental window and an easy dialog. Mercury (14+ Gemini) trine Rhadamanthus (14+ Libra Rx). Mercury (16+ Gemini) opposite Crantor (16+ Sagittarius Rx). Mercury (18+ Gemini) opposite Quaoar (18+ Sagittarius Rx). Quaoar is a really interesting point just beyond the orbit of Pluto. I believe it's associated with the power of our personal creation mythologies (everything from how we were created, to how we 'create ourselves' in the process of life) and family patterns that we enter unconsciously from birth. Mercury opposite this point is like a dialog with these ideas. Mercury (19+ Gemini) square Logos (19+ Virgo Rx). I consider Logos a kind of super Mercury. I think it's one of the most interesting of the objects beyond Pluto. Preliminary research indicates a connection to computer programming (among other things), and I associate it with the phrase, "the search for the soul of technology." This week's earthquake in China is the second of two recent events that qualify as Aries Point events. The first was the cyclone (known in our culture as a hurricane) that made landfall in Burma on May 2 and has, so far, killed an estimated 100,000 people. ShakeMap of earthquake in China. Earlier in May, I explained how the May 5 New Moon was precisely on the cross-quarter -- that is, at 15+ degrees of a fixed sign, in this case Taurus. I explained how this is 135 degrees (a sesquiquadrate aspect, which is a square plus a semi-square) to one of the cardinal points, which tends to magnify the news. In the past decade, all these events have the feeling of what used to be called Earth changes (this language originally came from Edgar Cayce and was adopted by the New Age in the 1980s). Two other memorable examples of Aries Point events are the Sept. 11 false flag attacks and the Asian tsunami of late 2004. Each has this sense that "something big is happening" and, if you're the type to use such language, "the end is near." The New Moon was square the centaur planet Nessus. A friend summed it up well when she wrote that Nessus "is associated with the dynamics of power and abuse, and in Aquarius is about those situations we are all collectively responsible for." The concept of responsibility stands tall now: both tragedies are mired in politics, including American politics. We could do more; we cannot (for one example) offend China, from whom we borrow $2 billion a day. Yesterday's was a 7.9 magnitude earthquake, the worst in the region since 1976. For the record, 7.9 is not the same thing everywhere. I felt a 6.8 once and, though this is significantly less, it felt like a Jell-o mold jiggling; the beer bottles didn't fall of the shelf in the local tavern. If the waves hit a different way, you can level part of society. Take the Myanmar tragedy, with the complications projected to take a million lives; relief is still being kept out generally, but the junta continues to vigorously export rice to Bangladesh and other points, while throwing their citizens the spoiled leftovers. The "election" went on as planned, even though 100,000 people are dead or unaccounted for and the country is in chaos. I sincerely feel that astrology needs to get out of the business of predicting disasters -- you won't read that stuff here -- but we do need to see the patterns for what they are and know what we are dealing with. So, an estimated 50,000 have died at one time in one day, and 10 to 100 times more in Myanmar. This is beyond comprehension -- think of the families of all those people, the communities lost, the networks. What is particularly sad regarding the event in China is the proximity to Tibet; one of the true points of historical grief on the planet at the moment. Associated Press reported that the earthquake occurred along a faultline "where South Asia pushes against the Eurasian land mass, smashing the Sichuan plain into mountains leading to the Tibetan highlands -- near communities that held sometimes violent protests against Chinese rule in mid-March." 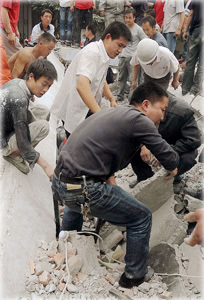 Rescue workers in China uncover rubble where 900 students are trapped. Image: Shanghai Daily. Then consider how about 154,000 people leave the planet, every day. Consider how an estimated 24,000 of those people die of hunger, every day -- many thousands of them children. Consider, in light of the Sept. 11 false flag attacks, wherein 2,998 people died, and then the United States tore up Afghanistan and Iraq and is, apparently, still planning an attack on Iran. To be clear, on Sept. 11, many more children died of starvation than New Yorkers perished in the event; and we don't hear about them except on late-night infomercials. We still hear about Sept. 11 in one form or another every time a politician opens his or her mouth. Therefore, while it's deeply tragic and truly beyond the sphere of an individual's understanding to hear of these events, I suggest that what we need to be questioning is the death-manufacturing industry. We are not impressed until these deaths happen all at once; it's like we don't notice the pain of the world otherwise. And there is plenty of it now. That, too, presents a paradox: awareness immediately leads to the awareness of the world's pain. We have a lot of incentive not to pay attention. At least these events cause us to notice for a little while. This being said, we have the question of how to respond. Is this rightly an excuse to stop living the adventure of our lives? Well, not if we really are doing that, and many of us know perfectly well that we are not. In which case, we can remind ourselves of the fleeting transience of existence as we perceive it, take a breath and resolve to live every day. WE LIVE in remarkable times, my friend. Given our heads-down, small-picture preoccupation with the details of our lives, few of us are aware of how much is changing around us and how quickly: except for the bad stuff. And there's plenty of that to go around, isn't there? 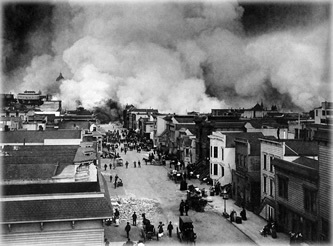 The San Francisco Mission District burning after the 1906 earthquake. Original Photographer: H.D. Chadwick. 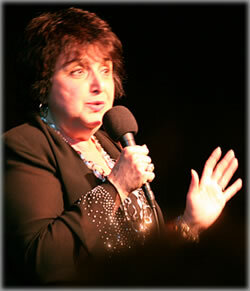 The Mother is on a rip now, giving us earthquakes and cyclones, tornados and floods, fires and extreme weather events. If that isn't enough, sinkholes the size of buildings are opening under us and the temperature shifts are creating mayhem with our comfort levels, plans and pocketbooks. San Francisco is all a' twitter as the Ring of Fire has produced a series of sharp quakes in the last weeks: talk of "the big one" is in the air. I grew up in the Bay Area, enjoying (seriously, I did and to everyone's disapproval) a couple of earthquakes a week, and talk of "the big one" is ALWAYS in the air, or at least since the city was all but destroyed in 1906. J.Z. Knight's Ramtha, a channel I admired in the 80s, said that those who lived on fault lines (which he called "zippers") were thrill seekers, adding that if they listened to their inner voice, they'd know when to leave an area before a major event. I must come from a long line of thrill seekers, since my family survived the '06 quake, and my grandfather, living in Anchorage, Alaska, made it through the 1964 quake and tsunami. Now I find that here in the Pea Patch, I'm plunked down over the top of a fault line called the New Madrid; one that produced the nation's largest recorded quake in 1812, felt over a million square miles and causing the Mississippi River to run backwards. Towns disappeared, lakes were formed, life went on; and that would be important to note, given our current level of fear. Eric Francis demystifies the ancient art of astrology for beginners and those with an elemental knowledge of astrology in Rhinebeck, NY from May 23-26. We learn how to understand our personal astrology and assist others with the basics of a natal chart and transits. We focus on how to use the astrological chart as a point of inquiry, how to listen to ourself or the client, and how to apply basic biographical information to get the results we desire. While we cover some of the traditional approaches to astrology, our main focus is on the new planet Chiron and techniques Eric Francis has developed to apply its wisdom. If you have been dabbling in or have long wanted to learn astrology, this workshop helps you to unmask its depth and power. Eric Francis has been a counseling astrologer, horoscope writer, and research astrologer practicing with clients around the world since 1995. He is a specialist in newly discovered planets and the psychological and spiritual processes they represent. You may feel like you have so many ideas that your head is going to explode if you don't express them all. I suggest you start with a small opening rather than a large one: a few thoughts on paper; a few sketches on the kitchen memo board. Get your creative momentum going gently. The next couple of months are likely to be so intellectually rich that you'll fill a notebook or two. There is another possibility, of course, which in your case would be a mental paper chase to rival a library getting hit by a missile. Either condition is a direct cosmic invitation to go on a profound search within: to explore the contents of your thoughts and feelings with no specific goal. The astrology is more akin to poetry than to journalism, though there is a place where the two meet, and you just might find it. Highly unusual turns of events in your life are underway, and they are calling on you to examine the patterns of your existence from every angle. You have reached a kind of Omega point, one of those inevitable thresholds where you notice not merely that change is inevitable, but welcome, necessary and liberating. But at the same time, the changes may cause you to doubt yourself, and be more than a little confusing. Your sign is the one associated by most astrologers with the concept of values, and in the deepest sense you are going through a thorough examination of what is the most important to you. Most people in Western society avoid this precisely because they might discover that what they thought was important to them is meaningless. This is usually regarded as terrifying rather than an opportunity to fill the empty cup. The choice is yours, but please do choose. You are about to have a few brilliant ideas, but this is not quite the breakthrough point. Therefore I suggest you apply a longer-than-usual time between concept and application. Take that time and revise your plans and ideas over approximately six or seven weeks. If you are inclined to think that is too long for your hopes, please consider astrology: Mercury retrograde in your sign through the late spring and early summer (the full process ends around the July 4 weekend, with a stunning New Moon). You get two choices: repair the airplane while it's flying, or design a positively fabulous one on the ground, take off, and arrive safely at your destination. Money is at stake, and your self-esteem. You like doing the job right, and feel better about yourself when you do. You may feel on the cusp of some profound emotional breakthrough. It's actually part of a series of ongoing developments that are taking you through layer after layer of your emotional reality. The next wave, which is being prompted by the Full Moon in your empathic water sign Scorpio, literally ushers you into a new world within yourself; a world where your inner visions are becoming more vivid than ever. Take your time to close your eyes and look around. Remember that you're bigger than anything you meet within yourself. Patiently give yourself opportunity after opportunity to express your revelations. Not everyone is as articulate as you are at the unseen world. What you perceive may be strange, and you may wonder whether it is true. Its truth is less important than witnessing honestly. What seems like an accidental slip involving a professional matter will have an unlikely productive result -- so do yourself and everyone a favor and don't take your errors so seriously. It is sometimes true that all things work together for the good; just as often, we seem to get caught in the mire of regret, and that has a way of blocking our awareness of the happenstance improvements resulting from things not going according to plan. In any case, you stand in a delightfully uncertain moment, full of strangeness and if you look for it, grace and light. Don't be too shocked if everyone else isn't as hard on themselves as you are on yourself. It is possible to resent others for not being trapped in guilt, regret or remorse but I assure you, anyone who is not stuck there did not arrive by accident. It either took a lot of hard work or a miracle. You might want to ask them precisely how it happened. You are embarking on a profound phase of reassessing your professional aspirations and life goals, and you would benefit significantly by doing so from the space of a clear conscience. What, exactly, have you done wrong? What, exactly, have others done wrong to you? In the scheme of things, it all adds up to a lot of trivia. Yet your life is not trivial. However, it takes a lot of courage to see, feel and embrace that fact. You may feel like you're pushing your luck, but in truth it is pulling you. The way to think, in a word, is big. You need freedom, and where you're going to find it is in sharing resources with others. Your life is not a game of survivor, where alliances are good only until the next person gets voted out of the kitchen. In the actual game of life, everyone has to eat every day. And the way we do that is to feed one another. You are sitting on some astonishing resources that you don't necessarily know you have, or have not necessarily considered. You may not think they are yours, per se, but you have access to them; you need them; and so does everyone else. The revelation may arrive at the end of the discussion, but that is better than never -- so keep the ideas flowing until you reach the gem. We are approaching the second Full Moon in your birth sign, which may be arriving with a feeling of futility (making a decision all over again) or going to a deeper layer (is how you felt a month ago, by the calendar, how you feel today)? Take it slow, if you can. Most of what you need to work through is in motion, and was long ago set in motion. Decisions don't need to be points of agony, but rather opportunities to apply logic, intuition and common sense. It is unlikely that all three of those factors will be in conflict. However, the stars say this: resolving something from your past, and stepping into a future that you know awaits you with a sense of authentic certainty, may take a little longer than you were planning. After being beset by delays, that may not be welcome news. But when you make your move, it will stick, and provide you with solid ground to build on. Pay attention to where you are, what you are thinking and what you are doing these very days. Make a map of your awareness -- for example, your ideas, projects, concerns and certain key goals. Take an hour and jot down a few theories about how you plan to resolve some of the bigger issues or puzzles you face today, and where you hope your creative projects are going to go. Note carefully, in writing, who is around you this very week, in these very days, even seemingly casual encounters. Keep their names, numbers and business cards in a special file and save it where you'll find it around the second week of November. You will need it then, and it will serve you well. At times you seem to exist outside your own reality, where the rules are all different and there is no way to tell what is coming next. At other times, you are free to explore your inner world in ways that suspend your usual cut-and-dried logic, tapping into your impressive sixth-sense that logic itself would seem to deny. The truth is, you know before you know; you feel before you feel; the distant past is as accessible as the immediate future. If along the way you're inclined to doubt your own methods, remind yourself all that is not known about the universe or the world. Imagine being a top scientist in May of 1908 and having a glimpse of the world in which we live today. Just about everyone afforded such a privilege would have said it was outrageous or impossible. Outrageous, perhaps; impossible, surely not. You have been under the influence of Neptune for so long, you probably have no tangible recollection of what life was like before it arrived in your sign. Neptune can be difficult in terms of knowing what you want, and the present moment is no exception. Yet over the next month or so, it's as if you're being fitted with an enhanced third eye that allows you to use Neptune to see into the dark and peer through solid walls. Like any new technology, it will take some time to learn and more time to master. You will be bestowed with power that you must use judiciously, which is another word for creatively. The critical message of your solar charts at the moment is to take nothing for granted; assume that nothing is as you currently perceive it. For example, you are far closer to one particular goal than you might imagine, and anything you perceive as a setback will provide you with dependable, highly original ideas for how to advance your own cause. Can you trust people? This is one of the questions humanity has grappled with for all of its recorded existence. There are people who think little of treachery; there are others who think little of giving themselves entirely. Neither of these two fairly rare types need to concern you. The people to focus your discernment on are those who cannot make up their mind. Beware of the color gray, and the feeling. Be mindful when anyone says one thing and then does another. The only way they can hurt you is if you fail to notice the pattern, and your charts say you run a chance of doing just that. Therefore, become a student of patterns, sequences, and of subtle variations on truth that may emerge from the process. Notice what they are, and make sure you use what you learn.